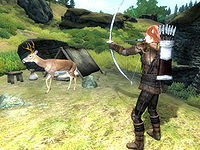 Alawen is a Bosmer archer who lives at Troll Candle Camp, south of the Gold Road between Anvil and Kvatch. She is the master trainer in Marksman and wants to influence your choice in equipment. Although she is rumored to be the best shot in Cyrodiil, Alawen is a bit of a loner and lives her entire life in solitude in her small camp composed of only a tent, a bedroll, and two sacks. She crawls out of her tent very early at 4am, and then patrols the campsite all morning and afternoon, hunting deer for venison using her silver bow. After a long and tiring day, at 8pm, she finally sits down on the stool and enjoys a two-hour dinner. At 10pm she crawls back into her tent for six hours of sleep. If you try to approach her while she is hunting, she will reject you with the words: "Leave me to my work, stranger." She wears a full set of leather armor excluding the helmet and shield; leather boots, greaves, gauntlets, and a cuirass. She carries a middle-class amount of gold and seven silver arrows for her bow. Though her fame as an archer has spread across Cyrodiil, it seems her exact location is unknown as Reman Broder and Pinarus Inventius are only able to give vague general areas as to where to find her, despite the fact that both agree on her unmatched prowess with a bow. Reman will say: "Last time I saw Alawen, she was out in the forest east of Anvil, and south of Kvatch. If you look carefully, you might find her there." and Pinarus Inventius concurs: "There's only one last thing I can say about Marksman training. If you want to be the best, you have to learn from the best. And the best I've ever seen is an Archer named Alawen. Not sure where she is now; last I heard, she had a camp east of Anvil, out in the forest." When asked again, they'll both say: "I've told you all I can. Seek out Alawen if you wish to train further with your bow." After you have received the necessary references from one of the advanced trainers, Alawen will greet you differently: "Why do you bother me, stranger? You make far too much noise." When asked for training, she will reply: "You wish to learn? Hmm. You have potential, I see, but your equipment! A true marksman is only as good as his bow. When you have a good, solid Elven bow, then I shall teach you what you need to know." After that, an annoyed Alawen will only say "What do you want now?" when you approach her, until you have an elven bow in your inventory: "You have the right equipment. This is good. Now I can teach you properly." After that, she will train you at all times, except when eating or sleeping. Alawen checks if the player has exactly one, instead of at least one elven bow in inventory and won't agree to train otherwise; drop all but one elven bow if this is the situation. Alawen's hunting often takes her too close to the unmarked bandit camp west of Dasek Moor, where she can meet an unintended death. 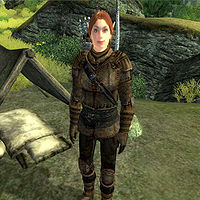 This issue has been addressed by the Unofficial Oblivion Patch; it makes her essential until she first agrees to train the player.